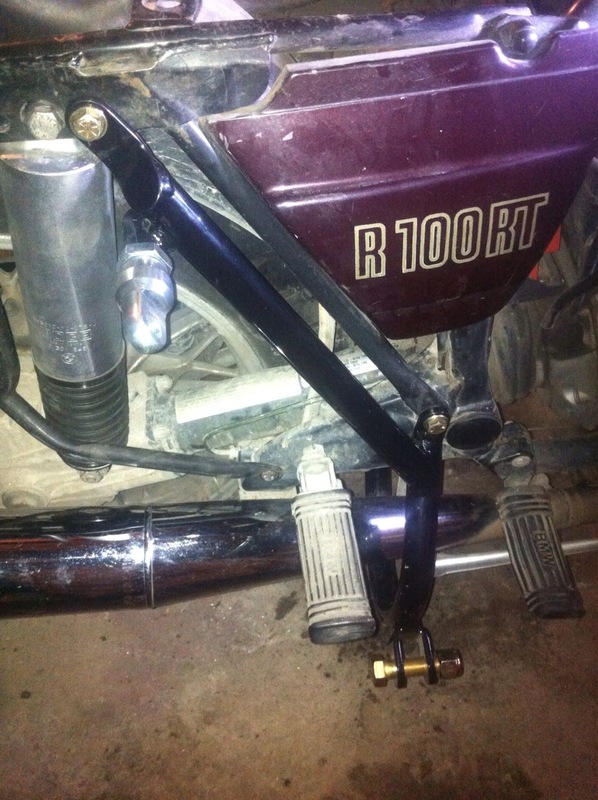 This evening, I started installing the DMC subframe on my bike. The previous owner included the installation instructions that he had received, just a couple of pages from an ink jet printer. The subframe was designed for a BMW /7 and there are some slight differences. Three existing holes needed to be enlarged from 8mm to 3/8". The top hole was right next to the upper shock mounting bolt. The eyebolt is for the upper rear support. 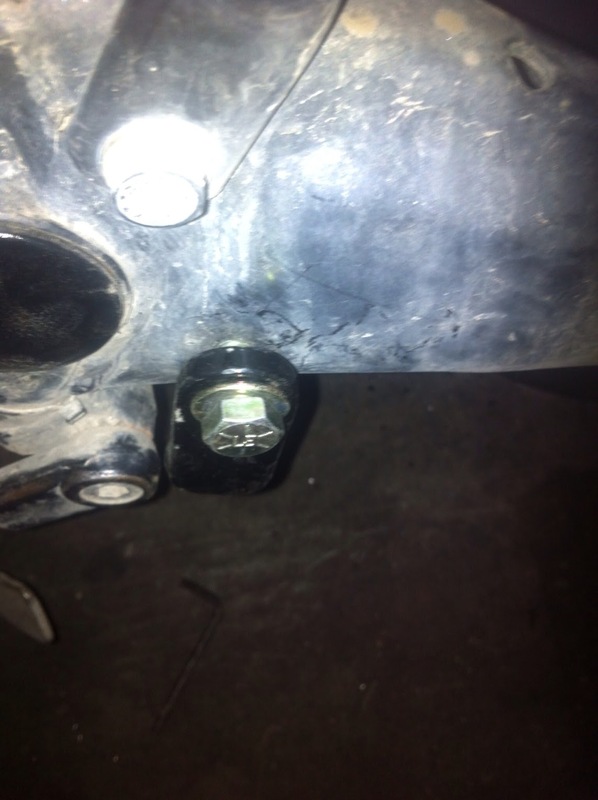 The lower mounting bolt was one of the main supports for the rear subframe. You can really see the difference in tubing size between the bike frame and the DMC subframe. The Cozy supplied mount used the upper shock mount for the rear support. You can see the lower mount for the sidecar on the curved tubing running underneath the muffler and swingarm to attach on the opposite side of the bike. All of the bolts are grade 8 and very sturdy. On this side, the only change was a single washer was needed between the subframe and the bike. This is the single mounting point on the left side of the bike. This hole was also unused and just needed to be enlarged to 3/8". The gap between the subframe and the bike on this side is about 5mm so I need to pick up some flat washers tomorrow before I can tighten everything down. I am really impressed at the quality of the DMC subframe. I need to remove the lower fairing before I can mount the front subframe. I suspect that I'll need to remove the Brown sidestand that I installed a couple of years ago since it also mounts to the rear engine bolt (all-thread running the width of the engine. I haven't heard back from DMC yet but I'm hoping that he isn't having second thoughts about modifying the front mount and supplying the additional parts and pieces. Cool stuff Richard, DMC makes good subframes but is not over abundant when it comes to assembly instructions. Luckily they do tend to answer the phone readily. So far, I only have a question about the upper mount on the front. The eyebolt seems long and I was wondering if it was deliberate. But the construction quality is first rate. It almost makes me want to clean the bike... Almost. I think the proper response to this post would be: oooooh, aaaahhhhh. I think it is really neat that you are getting the sidecar hooked up to your bike. You are going to have so much fun. This is almost like a farkle and the subframe is without question the shiniest part on the bike. Now comes the hard part, getting the Cozy parts attached to the DMC parts. It seems to be going smoothly...I hope you aren't like me. This would make me very nervous. I hope it keeps going smoothly and DMC comes through. I don't really anticipate any major problems. I do have an engineering background and spent quite a bit of time in machine shops designing and fabricating parts.